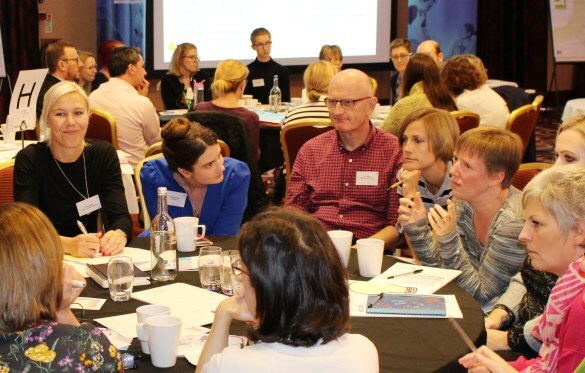 Members of the health and care community from across the West Country gathered in Cheltenham recently to collaborate on two important strands of our patient safety work around support for the deteriorating patient: the National Early Warning Score (NEWS) and the Recommended Summary Plan for Emergency Care and Treatment (ReSPECT). and appropriate de-escalation at end-of-life care. The event attendees represented all three of our Sustainability and Transformation Partnerships (STPs) in the West of England and a broad spectrum of disciplines, including patients and cares, primary care, community and mental health services, hospices, the ambulance service and acute care. The event provided the opportunity for delegates to update each other on progress being made in each area, celebrating successes and sharing challenges, as well as exploring our future direction. The NEWS conversations focused on both the ongoing transition to NEWS2 and how we can provide better care for people with learning disabilities, which will be a key strand to our work programme going forward. As well as providing updates on how each of the three STPs are taking forward ReSPECT since we launched the programme in the summer, we were delighted to hear from Dr Lucy Pocock from the University of Bristol on her fascinating and revealing end of life research in the West of England. We also heard a moving and inspiring story from Stephanie Nimmo, who shared personal experiences of caring for family members, which provide an incredible insight for any healthcare provider to consider when caring for patients with life-limiting conditions or at the end of life. Take a look at Stephanie’s website to find out more: www.wasthisintheplan.co.uk. Full details on all the talks, presentations and workshops are available in the event report available to download here. If you would like to get involved or want more information on either of these programmes, please contact the team at patientsafety@weahsn.net.